On a nice day, there are few things better than people-watching on the deck of Sam’s Anchor Cafe in Tiburon, CA with a cold beer and their signature Shrimp Louie salad. Still, fun though it may be, an afternoon at Sam’s can leave you with a sunburn and an empty wallet. I say kick it with your friends in the shade with my affordable version of the classic West Coast shrimp salad. Baby shrimp are surprisingly affordable and go perfectly with this spicy take on an otherwise traditional dressing. 4 tbsp cocktail sauce $2 for 10 oz. Juice one of the lemons and whisk the juice together with the mayonnaise, cocktail sauce, sugar or honey and jalapeno. Season with salt and pepper to taste. Pour into small serving cups (shot glasses work in a pinch) and set aside. Cut the remaining lemon into wedges and set aside. To assemble the salads, Divide the baby Romaine between 2 plates. Heap equal amounts of the baby shrimp in the center of the lettuce. 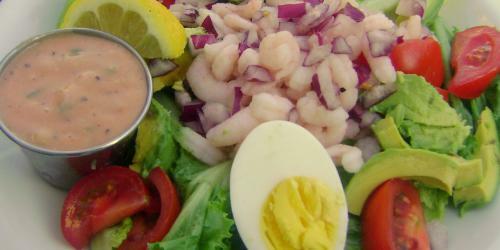 Arrange the tomatoes, avocado and egg halves around the shrimp and sprinkle the chopped red onion on top. Garnish with plenty of freshly-cracked pepper and lemon wedges. Serve the dressing on the side (as pictured). Bing is the most using search engine now in today’s world because this is come with Microsoft windows 10 OS as a default browser.You only need to know it’s all features and how to use properly through this online institute. This shrimp louie is extremely delicious to eat! I made this a few days ago and all of my paper writing servicees reviews mates ate it. They all enjoyed eating it and thanked me for making it. It’s the brightly coloured cube thing here you could either opt to run the app and afterwards, when triggered, go into in your e-mail address and also password. I really like this recipe, but personally I m not a fan on shrimps. Recently, I ate shrimps at โกลเด้นสล็อต, and just did not like them. I hope this recipe changes my perspective about shrimps. Wow, I followed the recipe to a T, but used canned crab meat from Walmart instead of shrimp. One of the best Crab Louie’s ever. Thanks…. I am simply commenting to permit you to identify the really superb experience my significant other’s youngster’s experience analyzing your web blog. She also found out some troubles, that included what it resembles to have a wonderful giving character to acquire the others successfully learn some advanced concerns. You actually did higher than her desires.